My customers are not interested in IPv6 ... what can I do? Shivlu left an interesting comment to my IPv6 is not ready for residential deployment post. He wrote: “Still no customer is ready for IPv6. How do I convince them?” The unfortunate answer to this problem is: you can't, but they'll only hurt themselves. If they persist long enough, they’ll become obsolete. The migration issues are just one of the topics covered in the Enterprise IPv6 Deployment workshop. You can attend an online version of the workshop or we can organize a dedicated event for your team. Dual-stack clients and pilot IPv6 content. We’ve entered this phase 15 years ago, when the IPv6 RFCs were published, but it only gained significant traction in the last months. Not surprisingly, Google has been on the forefront of IPv6 content deployment; they are one of the few companies that make true profit off the Internet and missing just a few percents of their customer base is a huge loss. IPv6-only clients and NAT64. IPv4 addresses will run out. You can live in denial, but it will happen. Large portions of the current Internet content will not be reachable over IPv6. Knowing the procrastinating mindsets of most PHBs I am willing to bet on that. The early adopters of IPv6-only clients (most likely the mobile networks) will have to deploy NAT64 to reach IPv4 content. However, as good as NAT64 might be, it will have deficiencies that will make native IPv6 applications more compelling. New IPv6-only applications. As soon as the critical mass of IPv6 clients will emerge, someone will create a snowball application that will only run on IPv6 (because life without NAT is easier), prompting users to move to IPv6 (just imagine Facebook having some exclusive features available only to IPv6 clients). IPv4 content becomes obsolete. 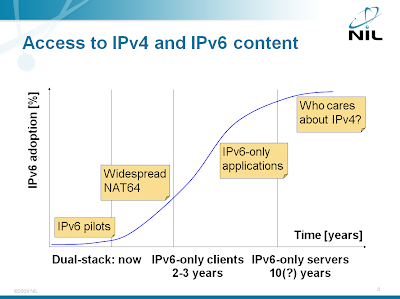 Once the customers start using IPv6 exclusively, they will start ignoring old content reachable over the NAT64 path. At that point in time, the few web sites that ignored the new reality will slowly wither and die. The problem is who takes the initiative in deploying IPv6- the SP or the web-content provider? Google is certainly showing the web-content providers should take the initiative. Most SPs' major customers are the home-users (broadband users). SPs should start assigning IPv6 addresses to these customers. Jeff Doyle on his blog has explained a great upcoming technology called Dual-stack lite where the end-users continue to use IPv4 addresses(private addresses) but their CPE tunnels IPv4 packets into IPv6 packets to the SP network where these packets are decapsulated and NAT (private IPv4 to public IPv4) is done. Hence, the end-users need not upgrade anything while the SP can install a Dual-stack Lite compatible CPE and perform NAT at the SP-end. The best one is 6VPE because in this no SP requires to migrate ipv4 backbone to ipv6 immediately. But the customers can use IPv6. For internet dual stack or NATPT is the best one. You probably meant 6PE. You only need 6VPE if you offer IPv6 VPNs (and not many people need those). BTW, forget NAT-PT. It's extinct, should not be used, and the IOS implementation is "somewhat" broken since they've removed fast switcihng from the IOS code. I think, During the migration phase NAT-PT is required if the customer is not willing to create the GRE tunnnel. Another concern for NAT-PT is when the user is using only IPv4 and wants to communicate with IPv6. Please share your thought process.